Zotac has come up with something to overcome the current “Atom issue” (No Windows 8 suppport for the built-in graphics unit) : Zotac equips their new ZOTAC D2550 ITX WiFi Supreme Mainboard with Intel Atom D2550 and NVIDIA GeForce GT 610 graphics unit and this way even brings a big performance boost. Experience a new generation of energy-efficient computing featuring a balance of CPU and GPU power with the ZOTAC D2550-ITX WiFi Supreme platform. Powered by the latest dual-core Intel® Atomâ„¢ D2550 processor paired with an NVIDIA® GeForce® GT 610 graphics processor, the ZOTAC D2550-ITX WiFi Supreme packs everything you need for a general-use desktop or home theatre PC into a compact mini-ITX form factor. The NVIDIA® GeForce® GT 610 graphics processor enables the ZOTAC D2550-ITX WiFi Supreme to deliver superior video playback features including hardware video decode acceleration for Blu-ray 3D, streaming Internet video and native 1080p24 output. 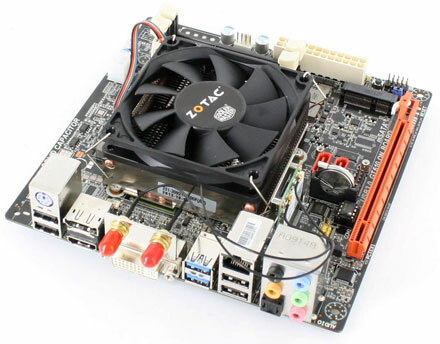 Onboard Gigabit Ethernet, 802.11n WiFi and Bluetooth 3.0 networking technologies on the ZOTAC D2550-ITX WiFi Supreme deliver outstanding network connectivity via wires or wireless to home network and peripherals. There is an updated version of Nuvo 2012 Atom barebone available now. Besides a second LAN port it offers an optional second analog VGA port. Nuvo 2021 : Fanless Atom D525 barebone with 2x PCI slot and 1x PCI-Express 4x slot. It is an Intel® Atom™ D525 IPC. It is, moreover, a reliable embedded fanless IPC. Nuvo-2000 accommodates up to three PCI/PCIe cards and two 2.5” hard drives in its shoe-box size. More than that, it provides versatile I/O interfaces such as COM ports, USB ports, 2x Gigabit Ethernet port, parallel port, not to mention that the isolated DIO channels can be integrated optionally into this compact box. Leveraging Intel® Atom™ D525 1.8GHz dual-core processor, Nuvo-2000 delivers adequate computing performance for most Industrial applications. We also give Nuvo-2000 ingenious design mechanically and electronically so it can have a reliable, embedded fanless operation in the temperature range of -20 to 70°C. Nuvo-2000 is designed for general-purpose usage. Its compact size, PCI/PCIe slots and simple yet useful I/O functions fit most applications where wall-mount IPC is currently deployed. 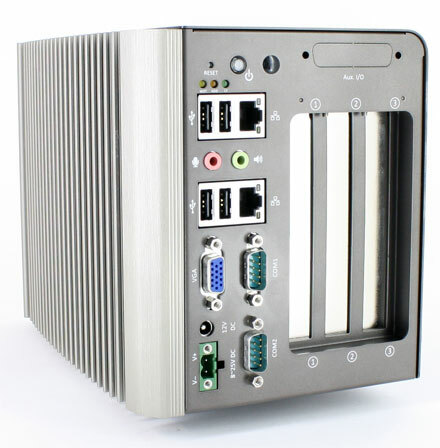 And, what is more, the embedded fanless design of Nuvo-2000 gives you much more reliability than an ordinary IPC in all kinds of environments.